Last week I was catching up with a friend of mine and we were making plans with our children for the Easter holidays. She asked me if I had heard of a local group that can be found on Facebook called ‘Chaddy Rocks’. This was my introduction to painted rocks, the new fun family craze which has swept the nation. I requested membership to the group as my friend explained the ‘game’. Basically, painted rocks can be found all over our local parks. These rocks have been painted by children for other children to find. Once children discover these rocks, a picture of the rock can be taken and added to the Facebook group. They then hide the rock elsewhere for someone else to find it, and the process continues. To further participate in this activity, you can paint your own rocks and then hide them in the local parks for other children to find. Yesterday we visited our local park for an Easter Sunday event. It was only whilst my daughters and I were taking part in the Easter Egg hunt that we first spotted a painted rock lying in a bush. We picked it up, took a picture of it and I explained the game to my children. We then hid the rock elsewhere. As we continued, the children began to actively look for more painted rocks, and in fact totally forgot about the Egg hunt they were embarking on! On our first expedition ,we found 10 painted rocks in around 20 minutes. This was such fun, the girls were so excited to find the next rock and my 4 year old was particularly good at finding places to hide the rocks once we had found them. As we completed the Egg hunt, we noticed that a stall at the event belonged to the Facebook group I had joined. My daughters were invited to decorate their own rocks and hide them in the park. A friendly face awaited us and the owner of the stall explained how the game works, she also gave us some really good tips on how to decorate the rocks. 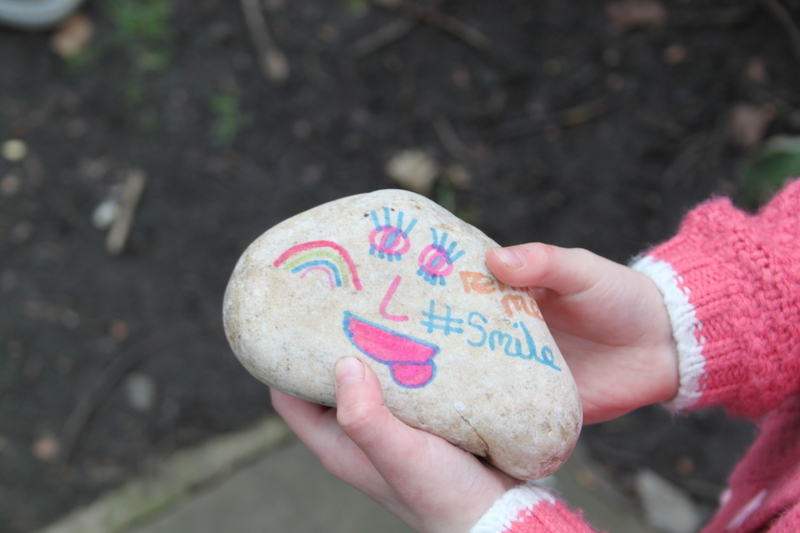 Aurelia coloured a rock and hid it in the park. To her delight, this evening on the Facebook group, a child was pictured holding her rock. Aurelia’s rock, pictured before we hid it. Alternatively, if painting, acrylic paint works best. Once the rock has been decorated however you wish, include the words of the local group on the rock (ours is Chaddy Rocks) and the words ‘Facebook’ and ‘rehide’. This way, the craze can spread. The general Facebook group for this game can be found here. Varnish the rocks once completed. Take them to your local park to hide! Click here for more top rock painting tips! I decided to write a post on this particular craze for a number of reasons: firstly, it is a free/low cost activity that can be done with your children. Secondly, and most importantly for me, it gets families outdoors and provides them with an outdoors activity that can be completed as a family. I was surprised to see both my 16 year old and 4 year old thoroughly enjoying themselves looking for rocks, and I must say, it is rather addictive!